SS series sensing rice sorting machine is specially for sorting light yellow rice and micro color spot rice. This type rice color sorter has excusive CMOS sensor and various color sorting models to provide high color identification and very lowest proportion of disqualified rice discharged. The color sorting machine is special used for sorting rice, millet, red rice and black rice in rice milling industry. 1.Hyper sorting rate of CMOS sensor and high speed signal processing system. 2.The professional rice camera lens guarantee all rice to image on the CMOS sensor. 3.Adopting high speed DSP digitalℑ processing technology make sorting quick and precise. 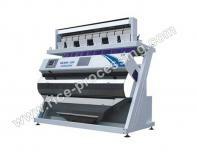 4.By advance optical designed system provide diversified and flexible color sorting models. 5.The host controlling system is by the means of high-end embedded ARM processing chip. 6.Much friendlier and convenient operational interface make the operation much easier. 7.Modularized structure is easy to maintain. 8.The high speed & professional air value ensures high accuracy and large unqualified rice be sorted for much deeper sortable rice. Our company is specialized exporter, manufacturer and supplier of SS Series Sensing Rice Sorting Machine in 中国.